As can be seen on the BBB, it has a number of usable pins at your disposal. Through further inspection I found out that one pin can have up to seven different modes. For instance one pin can be used for regular GPIO, PWM, UART, or I2c; this is done by pin-muxing. So through multiplexing the different modes can be set. Because the BBB does not POST at boot the only way to initialize hardware capabilities is through Device Tree Overlays (DTO). A DTO can be considered the equivalent of a driver. I am not sure if this is correct, but I am just stating what I have gathered from it through my own research. The best resource I have found with working with the BBB is on Derek Molloys site. I wouldn't have been able to get as far as I have in such a short time with watching his videos. A link will be posted I really recommend going there for more cool things BBB. For most applications it would be nice to keep from having to do this manually every time you turn your BBB on. 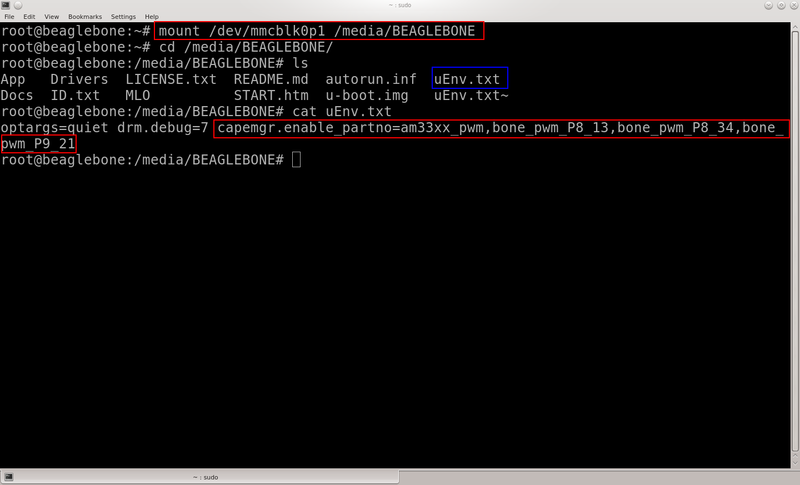 To do this, change the uEnv.txt file inside /media/BEAGLEBONE. An example of what I added to it to run three PWM pins can be seen in Figure 1. Additionally, If you are using a pin that by default is set for HDMI out, you will have to mount the file path manually. Both steps will be in Figure 1. To make it easier to access my Pins and Slots I made multiple shortcuts by modifying the .profile inside the /etc directory. I did this by exporting the file path into a user defined name, see Figure 2. With these modifications everything should be set at boot-up. To check the pins you can set the period and duty cycle to the shortcuts by echoing a value for each. Every servo is a little different, so the values can change. In the first video I show setting the period and duty cycle. The values will be close so they are a good reference. The BBB seems to be more than capable of controlling standard servos without a voltage regulator or transistor. If you are using DC motors or stepper motors that will be different. I do not have a circuit diagram, really all it is is the PWM pin from the BBB to the signal line for the servo. And the "black" and "red" wire from the servo to ground and 5V.